Mayfly nymphs are extremely abundant in many Wisconsin frestone trout streams and are a great food source for feeding trout. 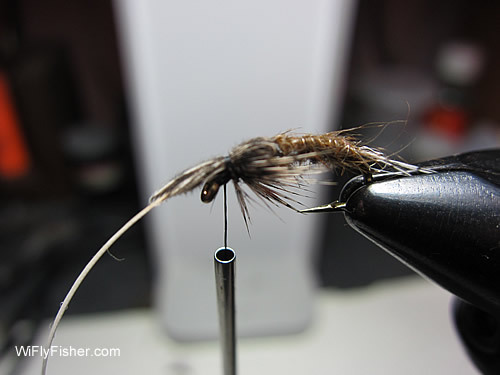 For my favorite nymph pattern I like to use grouse hackle and other bird feathers for both the mayfly's wingcase and legs. 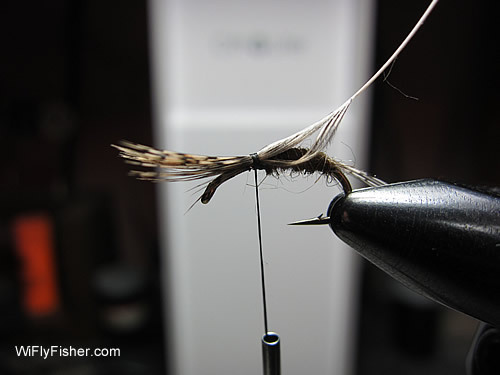 Often times the feathers are too large for the smaller hook sizes.. Rather than wasting grouse feathers I use the following method to tie my favorite mayfly nymph pattern on smaller size hooks. 2. Wind the thread foward to about 1/8" to 1/16" from the eye of the hook. Be sure the barbs sticking out from the hook eye are not too long. These will become the legs when done. 3. Now wrap the thread back and tie the thorax dubbing onto the hook. Find the center portion of the grouse feather and cut off the stem, leaving all the barbs tied down. (Be sure not to cut off the loose barbs, just the stem.) Or, cut the center portion of the stem off first before securing to the hook. See the note at bottom of page. 4. Using your fingers work the barbs back and point them down underneath the hook shank. Then secure the barbs with the thread. 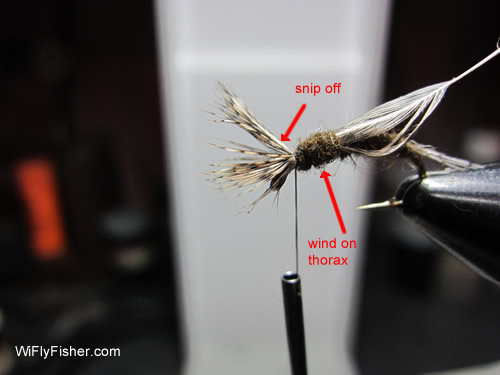 Pull the grouse feather stem forward folding it over the top of the dubbing and thorax. Secure the stem with a few wraps of thread and cut off the remaining stem portion of the feather sticking out over the hook eye. 5. 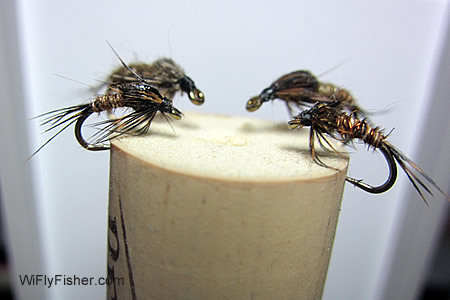 Finally tie the head of the fly, whip finish and apply head cement (if desired). 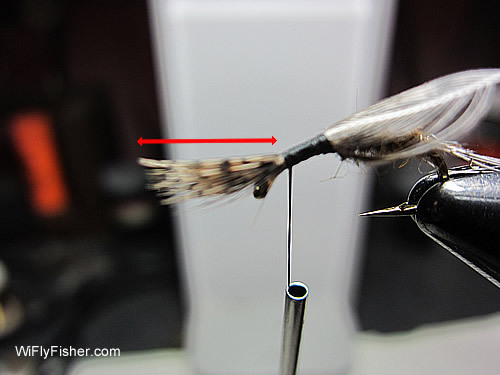 Note: For smaller size nymphs it is easier if you cut the tip of the stem off before tying the feather to the hook. Just be sure you leave enough barbs for the legs and for the wingcase when the feather is folded over the top of the thorax. 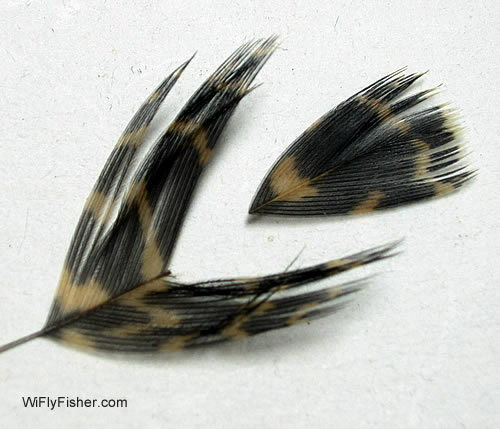 Besides the American ruffed grouse I also use English ruffed grouse feathers from Cooksville. The English ruffed grouse capes are generally darker in color, which represents better many of the smaller mayfly nymphs, such as the Ephemerella nymph species. 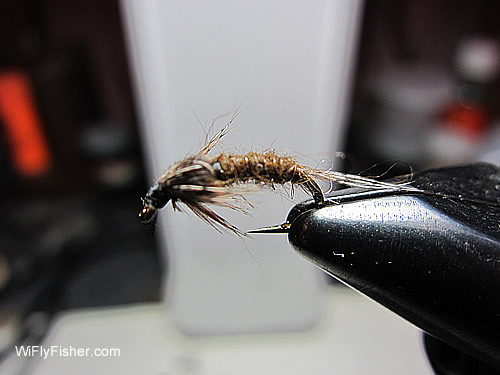 For most small mayfly nymphs (#16s or smaller) I prefer to use pheasant tail fibers for the body with either fine gold or copper wire ribbing.